Bangkok (Thailand) – February 16, 2018 (travelindex) Best Western Hotels & Resorts has unveiled a series of tempting special offers in Thailand, which will be available exclusively at Thai Tiew Thai 2018. This year’s edition of the popular tourism fair will take place at the Queen Sirikit National Convention Center (QSNCC), Bangkok, from March 1-4 2018. Attendees at Thai Tiew Thai 2018 will be able to take advantage of enticing promotions at multiple Best Western branded hotels and resorts in Thailand. 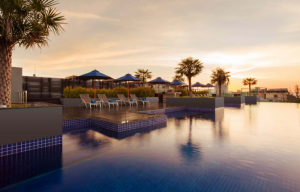 So whether you’re seeking a stylish city staycation in Bangkok, a relaxing beach break in Phuket, or even a special occasion such as a meeting or wedding, Best Western has the perfect promotion. Enjoy a special rate of THB 1,299 net per room per night including breakfast for two, free Wi-Fi and a free upgrade to a Pool View Room. Available for stays from April 1 – October 31, 2018. Unwind in paradise with a three-day, two-night package! Only THB 3,699 net for two nights in a Superior Room, including breakfast for two, free Wi-Fi and a complimentary airport transfer. This offer is available for stays from April 1 – October 31, 2018. Stay in the heart of Bangkok for a special rate of THB 1,700 net per night for a Superior Room, including breakfast for two and free Wi-Fi. Available for stays from now till December 23, 2018. Guests can take advantage of the “Super Hot Deal Promotion” at Asia’s first SureStay® Hotel, which offers a rate of THB 2,199 net per night for a Superior room, or THB 2,399 net per night for a Deluxe Room, including breakfast for two, free Wi-Fi and in-room minibar. Alternatively, guests can discover our “Sabai Promotion” for THB 1,999 net per night for a Superior Room or THB 2,199 net per night in a Deluxe Room. Both rates include breakfast for two and free Wi-Fi. All special promotions at the SureStay Plus Hotel by Best Western Sukhumvit 2 are available for stays from now till October 31, 2018. Special rates at our chic upscale hotel in downtown Bangkok are available from just THB 2,500 net per night for a Premier Room, including breakfast for two and free Wi-Fi. This offer is available for stays from now till December 23, 2018. Visitors to Thai Tiew Thai 2018 can arrange their next special occasion with a series of restaurant, meeting and wedding promotions at the Best Western Plus Wanda Grand Hotel, Bangkok! Guests dining at the hotel’s Vivanda Restaurant can pay just THB 1,000 to receive a dining voucher worth THB 1,500. This offer is valid until December 31, 2018. Under the “HOT Deal Meeting Package”, groups can book a full-day meeting for just THB 800 net per person (including lunch and two coffee breaks) or a half-day meeting for only THB 700 net per person (including lunch and one coffee break). Both packages are valid for meetings of 10 people or more, held before December 31, 2018 (booked and paid for by September 30, 2018). All meeting rooms come equipped with free Wi-Fi, an LCD projector and screen, flip chart, white board and markers. Finally, couples can celebrate their “Big Day” in style at the Best Western Plus Wanda Grand Hotel! The amazing “Wedding Package” promotion is offering 15 percent off weekday wedding parties (Monday – Friday) and 10 percent off weekend wedding parties (Saturdays and Sundays). These deals are valid for weddings held by December 31, 2018 (paid for and booked by September 30, 2018). Guests who want to take advantage of these promotions, visit us at booth numbers C035 and C044 at QSNCC.